Always nice to see some of the IABSM scenario packs in use, especially "Operation Compass", as it's one of my favourites. Fellow gamer Yarkshire Gamer is working his way through the pack but using his own house rules rather than I Ain't Been Shot, Mum. Here's a link to a nice post about the Operation Compass scenario pack. Yarkshire Gamer has been using the pack as the basis for his new campaign. Okay, so he's not using IABSM, but it just goes to confirm that the games in the TFL scenario packs are easily adaptable for other rule sets. Click here to visit the Yarkshire Gamer blog. Those of you who read my post about Battlefront's Dust Cloud terrain markers will know that I have had some stuff on backorder from them for some time. One of the other things that was on backorder was their Desert Fort and expansion pack. Now I can't remember exactly how this worked, but I think that they said they would only produce another batch of these if enough people agreed to buy them: a bit like a mini-kickstarter. Well I agreed to do so, and then promptly forgot all about it until the e-mails saying they were on the way started to arrive in my inbox, followed shortly afterwards by two quite big boxes. It's a lovely piece of battlefield terrain. The walls and turrets are really chunky...and I've just realised I've set it up in the picture above with all but one of the walls the wrong way round...but you can see from the left hand wall what it should look like! Plenty of room for figures on those parapets, and for at least light guns on the tower-tops. The expansion pack contains two ruined walls and two mid-wall towers that would allow you to double the length of two of the wall sides, provided you were happy to have the ruined walls included to make up two of the sides. Or you could just have the ruined walls as part of the original square fort. In all, this is a lovely set of kit, ideal for portraying the desert forts of the western desert in the early 1940's. It would also do, of course, for sci-fi wargaming, and for Beau Geste-style games as well. Recommended. PS Sorry about the pictures: I seem to have got most of the walls round the wrong way. That's what comes of drinking a bottle of wine whilst gaming, and then deciding to do a bit of photography afterwards! Keen to clear the painting table ready for my next major project (WW2 US Paras modelled on Band of Brothers' Easy Company), I've just finished a couple of British Morris CS9 armoured cars for the desert. Nice little models these, from Battlefront, and with some nice detailing on the hull and crew figure. They will represent vehicles from 11th Hussars for Operation Compass. 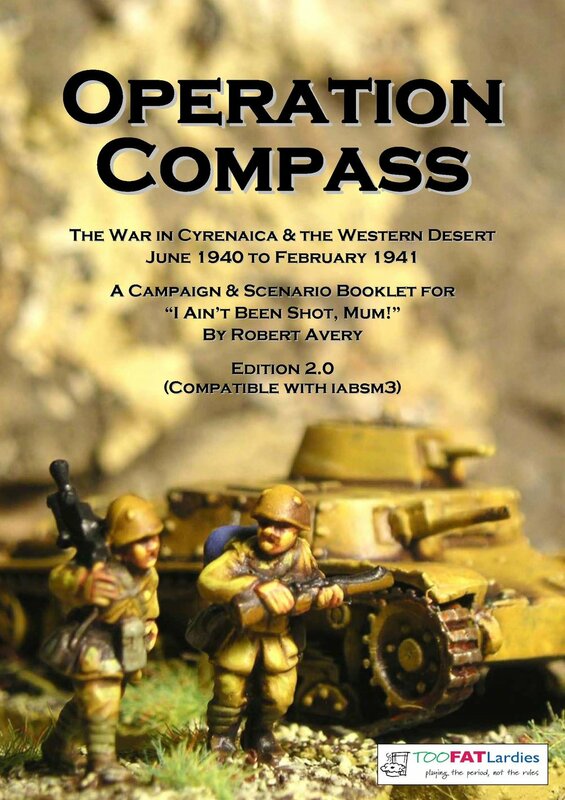 My final scenario pack updated for IABSM3 takes us to Libya and the opening phase of the war in the Western Desert: Operation Compass. The TFL Games Day 2011 took place on Sunday 12th June, with the action being a re-fight of the Commonwealth break-in to Tobruk in January 1941. Seven games were fought during the day. In the morning, the Commonwealth troops broke through the Italian perimeter. A lunchtime interlude saw the Matildas of 7TRT attempting to suppress the main Italian gun line. Finally, the Commonwealth troops fanned out, with three games charting their progress inside the perimeter. Full reports of the day's play, plus tons of photos! 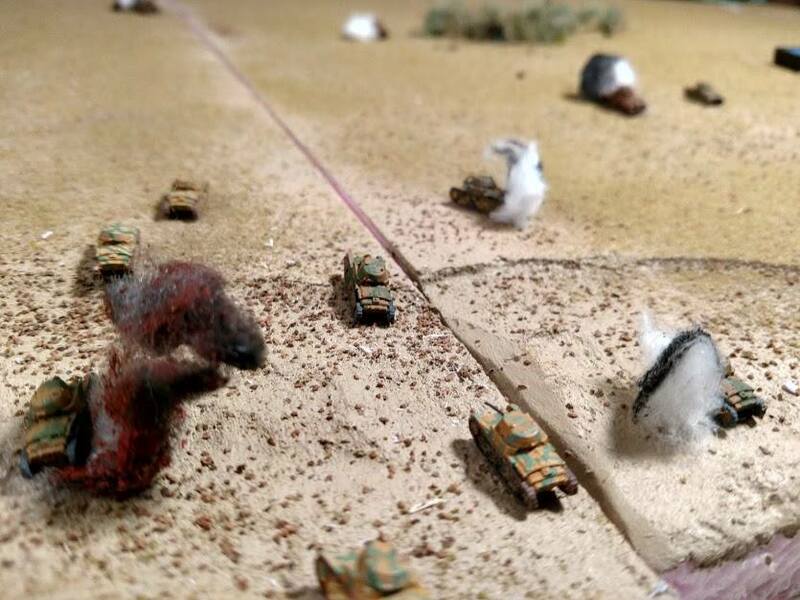 Zippee's second battle report from the Operation Compass scenario pack. 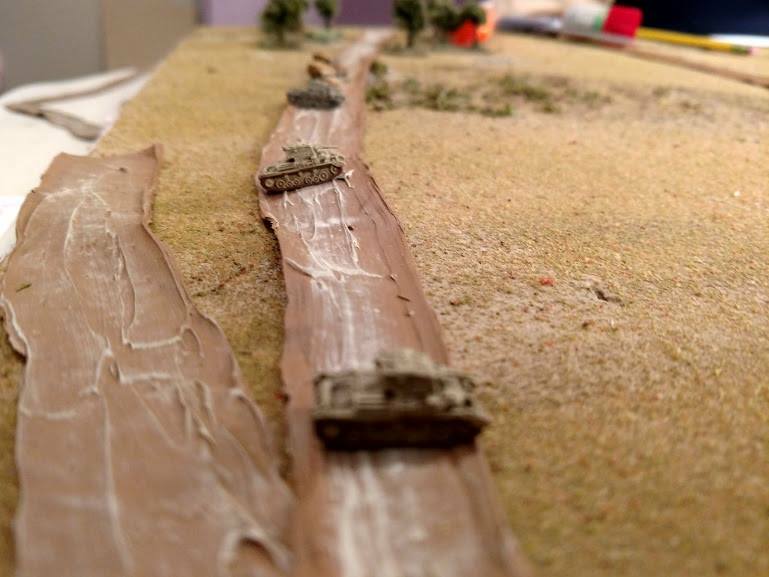 This time, British armour encounters an Italian column patrolling along the Wire.